Perrysville, Ind. 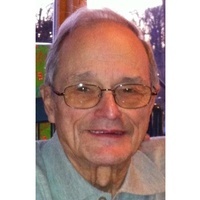 - Carl Hicks, 93, of Perrysville passed away Thursday morning, March 21, at his home. Carl was born February 1, 1926 in Perrysville to Daniel and Evea (Goff) Hicks. He graduated from Perrysville High School in 1943 and joined the Army Air Force as an aviation cadet during WWII. He trained as a B-29 flight engineer. After military service, Carl returned to the family farm and operated feed and farm supply stores in Perrysville and Covington. He was the first in western Indiana to sell farm chemicals for weed control. Carl married Delores Rick on November 27, 1947. They celebrated their 71st wedding anniversary last fall. Throughout his life, Carl was an innovator eager to try the latest techniques in farming and business. In addition to building a successful farming operation, he served as Highland Township Trustee for 8 years and represented Indiana agriculture on the Governor's State Advisory Commission during Otis Bowen's administration. Carl was a member of Christian Union Chapel and the Perrysville Unity Lodge #344 where he was a 32nd degree Mason. He was a member of the former Perrysville Lions Club and the American Legion. After retiring from farming, Carl and Delores owned and operated the Perrysville Handy Mart for 22 years. They enjoyed spending time together, playing cards and traveling. Carl is survived by his wife Delores, their sons Larry (Sheila) Hicks and Randy (Kay) Hicks of Perrysville, daughter Sandy (Joe) Rigsby of West Bloomfield, MI, and ten grandchildren: Jim (Lacy) Hicks of Bloomington, IL; Joe (Kim) Hicks of Tampa, FL; Whitney (Dave) Sokola of Tilton, IL; Ryan (Stephanie) Hicks of Perrysville; Tim (Jessica) Hicks of Carmel; Kelly (Seth) Kimmerling of Fishers; Brent (Marilyn) Hicks of Chicago, IL; Carla (Scott) Van Kampen of Farmington Hills, MI; Michelle (Garth) Sabo of East Lansing, MI; Matt (Amanda) Rigsby of Milford, MI. He was beloved by 14 great-grandchildren as well. Carl was preceded in death by his daughter Sherry Ackelmire, grandson James Carl Ackelmire, brothers Jene and Ray, and his parents. Services will be held Sunday, March 24, 2019 at 3 p.m. EDT at DeVerter Funeral Home in Cayuga, Indiana with Rev. Tony Demoss officiating. Burial will take place at Hicks Cemetery in Perrysville, Indiana. Visitation will be held on Sunday, March 24, 2019 from 1 p.m. EDT until time of services at the funeral home. The family asks donations be made to CDH Scholarship, in care of Western Indiana Community Foundation, PO Box 175, Covington, IN 47932. DeVerter Funeral Home in Cayuga, Indiana is assisting the family. Visitation will be held on Sunday, March 24, 2019 from 1 p.m. EDT until time of services.